Eat The Corn celebrates today its 10th anniversary! The site was launched on this day in 2005. The remarks grew into full-blown “Field Reports” on every single mythology episode of the series. If put together they would total into a book of several hundred pages! While some early reviews have aged with my evolving writing style, several still hold well, and in all cases they capture a unique energy and enthusiasm about the series. The reviews led to the synthetic picture presented in the Mytharc Primer, a complete explanation of the mythology connecting all the dots. Since it was written, the site and its collaborators have developed Spanish and German translations! — contact me if you want to help me translate it into your language. 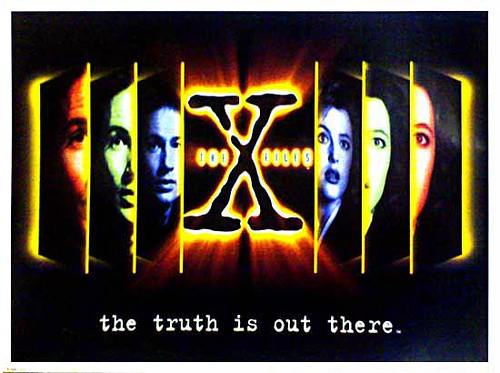 The search for quotes in the behind-the-scenes making of the series led to the creation of the Ten Thirteen Interviews Database, an archival database with interviews mainly from Chris Carter and crew but not only, that has about 500 entries and aims to expand in the future. The passion for Mark Snow’s music and the great releases of soundtracks in recent years led to the Massive Music Compilation with music list and requests from 150 episodes. In recent years the site has become known for its in-depth “Lowdowns” of the IDW comics, and been thanked by comics author Joe Harris. …and much more in the Dossiers section, such as a Chris Carter interview with partner site the X-Files Lexicon, a review of all visual influences on the X-Files, and more. The site has expanded to Facebook and Twitter, where there’s much more activity now than on the core website. The site began just as the entire series finished being edited in DVD. It went through a period of low activity in all things Chris Carter, then through the resurgence of activity around the release of the second film and the Back to Frank Black campaign, the rumors of Carter’s new series — then again a period of calm until the comics started in 2013, and with them a wave of 1990s revivals that brought the X-Files back to current pop culture discussions. And so here we are in 2015, on the verge of the release of the definitive BluRay edition of the series, and of the return of the X-Files on the small screen! EatTheCorn has become, dare I say, one of the reference sites worldwide for the X-Files and Chris Carter. It’s been a great ride! And I hope you’ll continue sharing the rest of the road with me. After the Spanish version a few months ago, EatTheCorn is proud to present its Mytharc Primer, the definitive chronicle and explanation of the X-Files mythology (until further notice in barely a few months’ time!…) — in German! Begrüßen unsere Besucher aus Deutschland, Österreich, der Schweiz und anderen Ländern! Hier finden Sie eine Zusammenfassung und eine detaillierte Erklärung über die X-Files Mythologie finden.